Please read the patient information booklet completely. 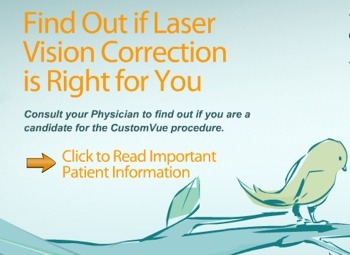 Discuss any questions with your doctor before you decide if CustomVue i LASIK is right for you. Only an eye care professional trained in laser vision correction can determine whether you are a suitable candidate. Why Should I Have CustomVue? Our newest advance in the surgery is the addition of a laser to create the flap of LASIK. We no longer use a blade, what is still done in many local centers, but a IntraLase laser which is 6 times safer than a blade. Most prior LASIK problems would occur because of bad blade cut. The all-laser flap is the most up-to-date way to create a flap with lowest risk. This technology has been approved by NASA for their astronauts, showing the faith they have in its ability to safely improve vision.